I am really excited to share this second-round of photos from my series showing loving Muslim families that are sorely under-represented in a time of heightened Muslim fear. I have had the good fortune of knowing Samia Jayed since we both worked for KIPP Houston. 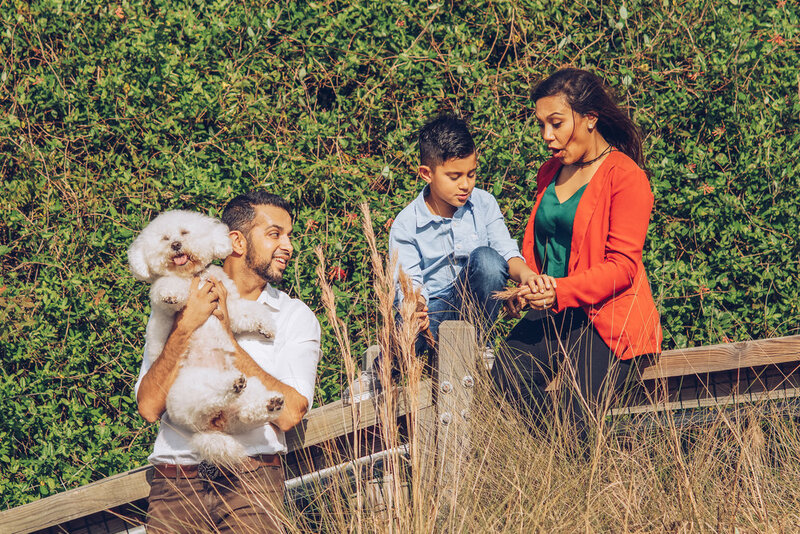 Samia has always been a warm, welcoming, detail oriented, and hard-working presence and those qualities are even more felt after seeing the qualities she and her husband, Aman, have passed onto their son! It's beautifully clear after watching her family interact that there's nothing but love to see here. What also stood out to me is that there's nothing out of the ordinary about these photos either. These are three people and a puppy that just love each other, that put good out into the world, and are trying to live their lives as best as they can. I was taught the basic principals of Islam by my mother—first and foremost is to be a good human and be respectful of others. What I have learned is that every religion has the same basic principals, and somewhere in the middle we look beyond those basic principals to find ways to divide us. Aman and I both moved here at a fairly young age, and we have learned that the commonality between our faith and law of the land aren’t very different. Amongst our friends and neighbors, we do not feel any different because we are a muslim family, and we are so fortunate to have such a diverse community. We just hope that those that haven’t had the opportunity to interact with other Muslims or people of different cultures, will make an attempt to broaden their circle and I am hopeful they will feel welcomed in doing so. Thank you so much, Samia and Aman! It was so wonderful getting to take your photos and to spread your wonderful message!